CHICAGO — Inspired by the Halloween and Thanksgiving holidays, this quarter’s American Coin-Op Your Views survey challenged coin laundry owners to admit their darkest fears and to identify those things for which they give thanks. The majority of vended laundry owners (31.7%) consider a “competitor [opening] a new store nearby” as the most frightening ownership scenario. 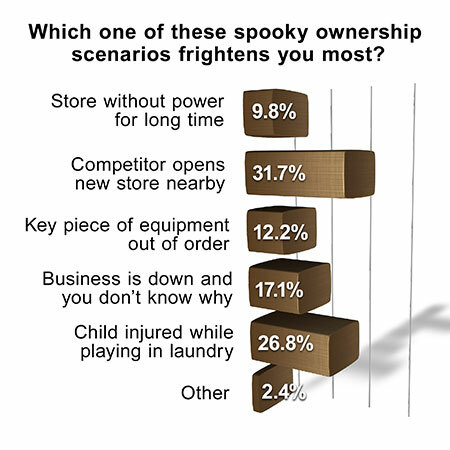 Some other possibilities that give responding store owners the creeps include a “Child [is] injured while playing in [the] laundry” (26.8%); “Business is down and you don’t know why” (17.1%); “Key piece of equipment is out of order” (12.2%); and “[The] store will be without power for [a] long period of time” (9.8%). American Coin-Op asked the trade audience if they agreed with this statement: “Our equipment works well and isn’t a concern.” The level of agreement was less concentrated, yet still overwhelmingly positive. Roughly 44% “completely agree” with the statement and another 41.5% “somewhat agree.” Much smaller shares “neither agree nor disagree” (2.4%), “somewhat disagree” (9.8%) or “completely disagree” (2.4%). 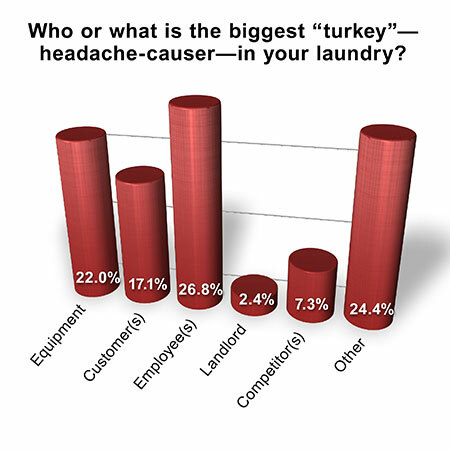 Who or what is the biggest “turkey”—headache-causer—in your self-service laundry? Top pick among respondents was “employee(s),” at 26.8%, but not far behind were “other” (24.4%), “equipment” (22.0%) and “customer(s)” (17.1%). In the “other” category, individual responses were often tied to utility rates or business taxes/fees. The publication also asked respondents to name one aspect of their business for which they are most thankful. The most popular responses related to loyal customers, good employees, and the ability to make a living. American Coin-Op’s Your Views survey presents an unscientific snapshot of the trade audience’s viewpoints. Due to rounding, percentages may not add up to 100%. Subscribers to American Coin-Op e-mails are invited to participate anonymously in the quarterly industry survey. The entire audience is encouraged to participate, as a greater number of responses helps to better define owner/operator opinions and industry trends.